Managing cloud services is nothing like the classical portfolio management. Where classical IT portfolio management is focused on aligning IT resources with the business needs, Cloud computing is all about increasing added value. Mainly in the form of increasing the responsiveness of the operation and the creation of more functionality for less money. In a cloud like environment, the IT organization is accountable for the investments (CAPEX) to make cloud services available as well as the expenses (OPEX) of the consumption of cloud services from an external cloud provider. For the orchestration of all of this the IT organization is end responsible and accountable. It creates an earthquake in the way the IT organization are managed. 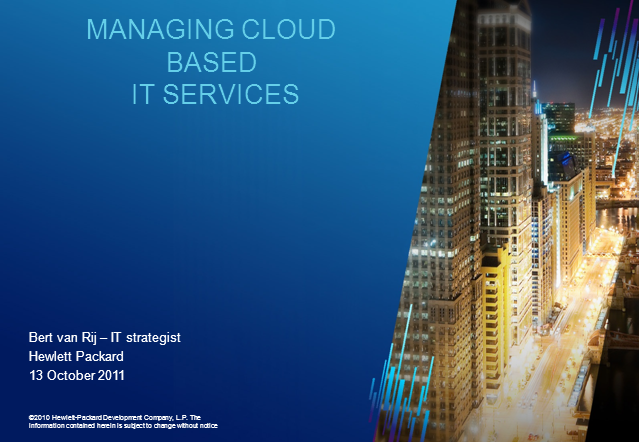 This presentations gives you an overview of the management consequences and implications of managing a cloud based IT environment. First the scope and limitations of cloud computing are defined, then an overview is provides of the implications and alternatives of moving to a cloud like environment.